The floor area of the main barn is approximately 120sqm and the roof is 4 metres high in the centre. The main barn can be used for a variety of uses. There is plenty of space for dancing, a ceilidh, DJ and can be laid out with chairs and tables for eating. The main barn is carpeted with a deep green recycled carpet. Access to the main barn is through two large double doors onto the car parking area outside. The wagon room is adjacent to the main barn and is accessed through double doors at one end. We have approximately 80 substantial wooden chairs with a small cushion attached for extra comfort. 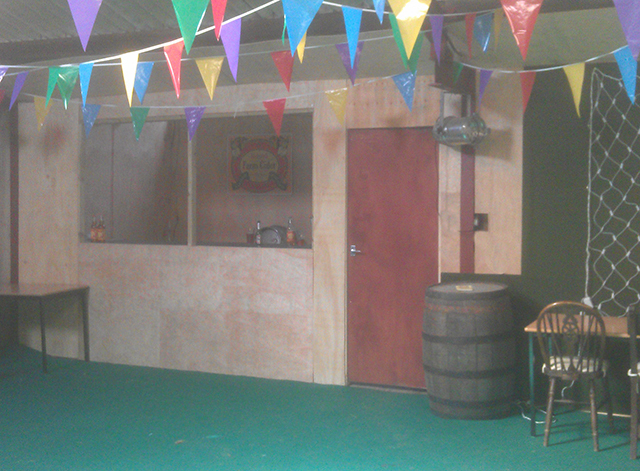 The chairs can be removed from the barn at certain times if more space is required for a dancefloor. We currently have over 30 tables. Size - 120cm high, 60cm wide, 70cm high. Please note we are not able to provide a cloth / cover. We recommend purchasing disposable ones that perhaps compliment your theme. Under no circumstances is any furniture allowed to obstruct any emergency exits. We currently have 2 powerful multicolour LED parcan lights which can be set on a particular colour or they can sound activated. These two lights can be positioned in a variety of positions on the roof girders. We have numerous sets of LED net lights and strings which can be positioned almost all over the barn. These lighting sets have various controls which you can set. Some clever lighting makes a big difference when it goes dark and can transform the barn. Other additions include trees! Yes thats right - if you want to create a woodland atmosphere we have several branches which look can look great in the barn. We created an exciting event which included flying owls around the barn over peoples heads. We also have various indoor games including a table tennis table and micro snooker which are available for use.